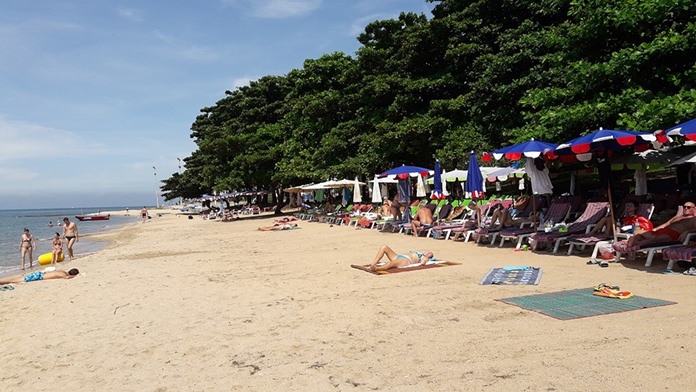 High season is dawning in Pattaya, with European tourists returning to Yim Yom Beach. Russian, Norwegian, Danish, Swedish and British tourists made up the majority of visitors to the Pratamnak Hill shoreline Nov. 26. Beach chair vendors, restaurants and masseuses were all busy. Nicha Chansaguan, one of the local vendors, said she was having one of her best days of the year. Low season was terribly quiet, she said, but it looks like things are turning around. One group notable for its absence were the Chinese, but most the chairs were full of Russians and westerners, so vendors seemed happy.